1. The internal filament repeatedly described, as in the dental extraction samples, appears to be a primary pathogenic form. These internal biological filaments have been identified, to a varying degree, in essentially all individuals that have participated in the testing process thus far. 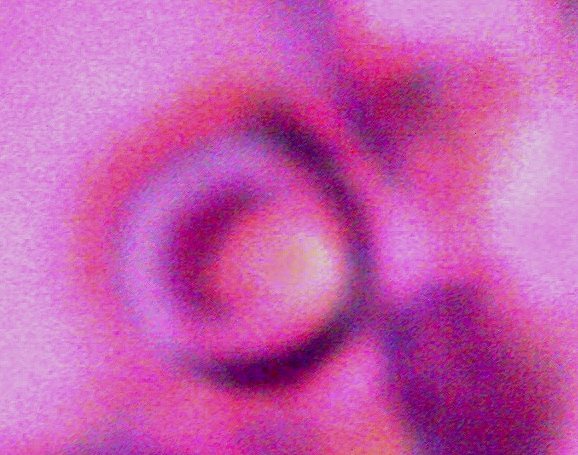 The blood of participating individuals also displays, to a high correspondence, anomalies in structural integrity. 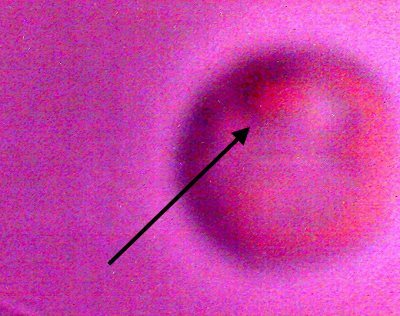 A sub-micron spherical structure, to be assessed in further detail at a later point, also commonly occurs within the erythrocytes. 2. The morphology, size, structure and chemistry of these internal filaments appears to be highly similar to that of certain environmental filament samples, notably that which has been refused by the Environmental Protection Agency (EPA) for identification. In addition, numerous research papers over the last ten years document the repeated detection of unusual biological components within a series of environmental samples, including that of erythrocytic (red blood cell) forms. 3. Numerous cultures have been developed from the internal filaments on agar and in wine based mediums. These cultures are essentially identical in form and chemistry with that of the original internal biological filament samples. 4. The cultures produced from the internal biological filaments (dental samples) have been shown to produce an erythocytic form. These cultures have produced a positive result for the existence of hemoglobin by two separate forensic level tests. The determination of the erythrocytic form is also repeatedly evidenced by direct observation, measurement and biconcave morphology. 5. The production of erythrocytic forms within direct biological filament samples and by culture is completely outside the known boundaries of conventional science and biology. It is repeatedly evident that these same erythrocytic forms can withstand (and even flourish in) extremely adverse environmental, chemical and thermal conditions. 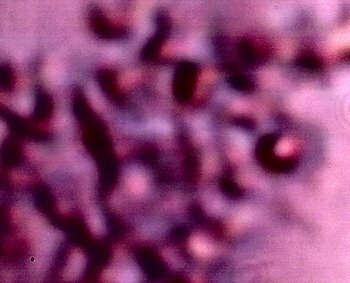 The evidence thus far indicates the original erythrocytic form is dessicated or spore-like and a reconstitution process is required to bring the cellular structures to full form and activity. 6. A method has been developed to break down the outer casing of the internal biological dental filaments. The internal components of these filaments have been examined in detail upon repeated occasions. Two main structures emerge: an erythrocytic form and a sub-micron spherical form. 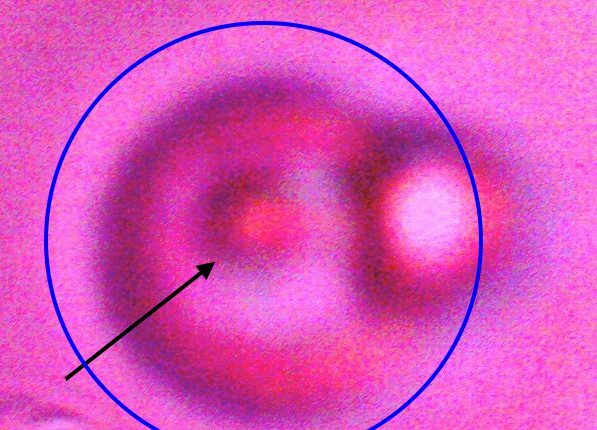 The best current assessment of the sub-micron spherical form is that of being Chlamydia-like, with a special interest in Chlamydia Pneuomonia. 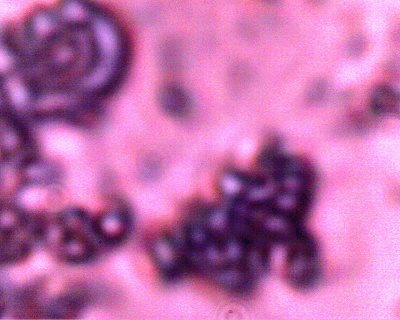 Mycoplasma forms are also strong candidates of consideration as a “tertiary form” that is also frequently observed. Please also refer to the the paper entitled Pathogens and the General Population, April 2008, for the introduction of the Chlamydia-like structure as a primary topic of interest; the rationale of identification for this candidate remains. In addition, recent size measurements and the response of the Chlamydia-like structure to Giemsa stain further solidifies that rationale. 7. There is a strong consideration that the internal structures from the internal biological filaments are of a synthetic or artificial nature. This assessment is based upon an observed uniformity in geometry as well as the hostile chemical environment under which reconstitution takes place. 8. The internal biological filaments and the cultured form of the filaments have been subjected to the same chemical and thermal breakdown process. The same two internal structures are evident and observed in each case, that of an erthyocytic form and a Chlamydia-like form. 9. 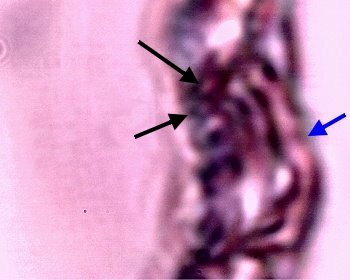 The existence of the internal biological filaments, the existence of introduced or modified erthrocytic forms, the Chlamydia-like structure and the tertiary form are interpreted by this researcher to be critical and central aspects of the ” Morgellons” condition. It is accepted that numerous symptom manifestations are reported in association with the condition; this report simply enumerates that which exists as a common denominator within all studies conducted thus far. 10. The source of the erythrocytic form and the Chlamydia-like organism is the filament under study, either in the direct biological internal form or identically from the cultured source. This assessment is reached through direct observation. 1. Original filament form (biological or cultured). 2. Decomposition of the filament through chemical and thermal processes. 3. A single drop of the resulting solution is sufficient to reproduce the entire cycle. 4. 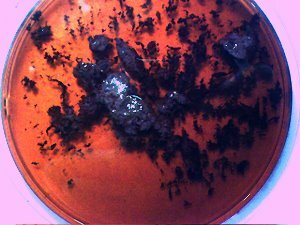 The decomposed filament solution is cultured in a wine medium. 5. Two structures appear simultaneously over a period of several days within the solution when observed under the microscope: The Chlamydia-like form and the pleomorophic form (Mycloplasma candidate). Visually this material has an appearance similar to that of the original dental filament extractions, but not as fully developed. 6. Lastly, the original filament form (white in color) appears on the surface of the solution, completing the full cycle of development and growth. 1. The encasing filament which appears to serve the purpose of housing, transport and delivery of the internal components. 3. A Chlamydia-like structure ( primarily internal to the filament). 4. An apparent pleomorphic form (primarily internal to the filament). One candidate of identification is a Mycoplasma variant. 5. All items listed require positive analytic, chemical and biological testing and identification; candidate mention is dependent upon resources available at this time. The ability of the structures to withstand hostile and adverse chemical and environmental conditions strongly indicates modification to originating organisms or structures. 13. 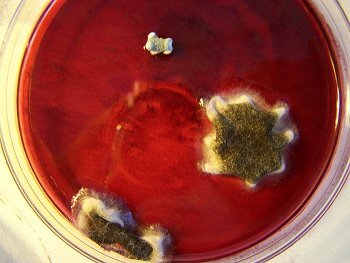 It can be shown by direct observation that the cultured filaments, after decomposition through chemical and thermal processes, appear to be the source of the blood anomalies first reported on by this researcher in November and December 2007. It is anticipated that the direct biological form of the filaments is likely to produce an identical result, as the cultured forms derive from the direct biological forms. Please also refer to the papers entitled Blood Testing and Morgellons : Airborne, Skin and Blood – A Match for a partial background preparation on this subject. Three structures are observed in the process : erythrocytic, Chamydia-like, and a “pleomorphic” (many form) ribbon or sausage-like form as shown in these original papers. 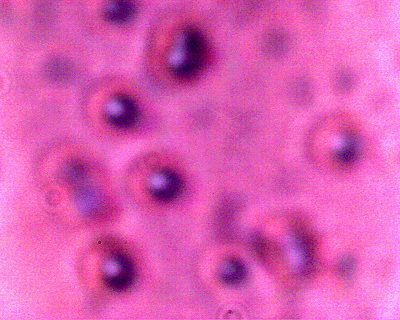 A mycoplasma form is a viable candidate for the “pleomorphic” (tertiary) form. Blood cells (incl. white blood cells ‘leucocytes’, and red blood cells ‘erythrocytes’). 15. There are now strong parallels of interest (specifically Chlamyida Pneumonia and Mycoplasma) that have emerged between the current work and that of prominent research on the so-called “Gulf War Syndrome”. Additional parallels of interest occur with such conditions as Lyme Disease, fibromyalgia and Chronic Fatigue Syndrome. 16. The structure, chemistry and internal composition of the biological based filaments appears at this stage to be essentially identical to that of the cultured filaments. This offers the distinct advantage that numerous research projects can now be pursued within a controlled laboratory environment, including that of growth inhibition. 17. It is understood that there are likely many numerous variations of development, form and manifestation with respect to the ” Morgellons” condition. This researcher has focused on, and continues to focus on, those elements that appear to exist as a common denominator in most (or all) subjects, regardless of any external symptoms that may or may not be present. It remains the assessment of this researcher that the blood (and the alteration of it) and the existence of certain filament forms (INTERNAL to the body) are central to the condition. The existence of skin anomalies does not appear to be, in any way, a suitable criteria for establishing or denying the existence of the condition. Thus far, essentially any individual that has been studied displays, to a varying degree, the common denominators of blood anomalies and filament existence that are a basis of this report. Exceptions to this last statement in some fashion are presumed to exist (although not identified thus far) and they are an obvious desirable pursuit in the research. 18. Future immediate needs include a full protein and genetic analysis of the filament forms, cultures and components that have been repeatedly identified. Additional resources will be required to accomplish this. 19. Growth inhibition studies, especially upon the culture forms that have been developed, also exist as an immediate requirement. Preliminary studies with prospect are in progress. Additional resources can accelerate this process. 20. The available information indicates that the human condition is likely to have been affected en masse. Original previously analyzed dental sample material in wine base. Essentially all individuals tested thus far produce varying degrees of this dental filament material. 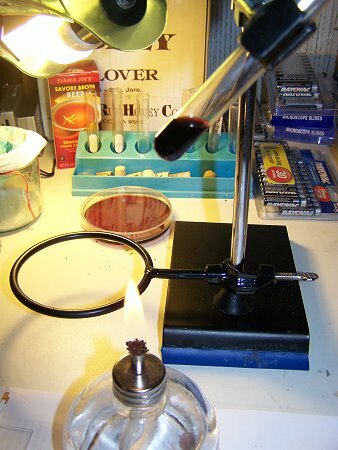 Representative dental sample material, previously analyzed, placed onto a glass slide. This particular sample uses a wine-hydrogen peroxide base mix. The culture of the dental filaments at the early stage. Characterized by a pure white color. Microscopic and time lapse imagery of this development are available in more detail in the papers entitled Culture Breakthrough (? ), (Jul 2008), Culture Work is Confirmed (Aug 2008) and Morgellons : Growth Captured (Aug 2008). This is the culture material used in this test. This culture has been developed from extracted dental samples that have been placed within a red wine culture medium. The approximate time of development is approximately two weeks. The first stage of development is characterized by a pure white filament as shown above; subsequent stages will transform to a greenish color and ultimately to a deep black color. A close-up of the culture development to the left. This is typical of a culture in the mid to mature development stage. Folding with the developed culture is common during maturation. Growth and folding up to approximately 3/4″ to 1″ has. been. observed, apparently only restrained by the lid of the culture dish and the available growth medium. Decomposition of the filaments, either biological or cultured, involves the use of an alkali solution and heat. Currently, the filaments are placed within approximately 1-2 ml. of distilled water with a drop of concentrated sodium and potassium hydroxide added. The concentration of the base can be determined at a later point; it does not appear to be critical at this stage. Initial decomposition takes place along with a transformation of the solution to a blackish color. The addition of heat, to the boiling point, appears to be an additional critical factor in the decomposition process. The addition of the strong alkali and the additional heat will turn the final solution to a deep red color (visually similar to that of blood in solution). If the solution is made in a concentrated form, i.e., limited water, the subsequent examination of components under the microscope will be facilitated. An erythrocytic form that appears from within a cultured filament after decomposition by chemical and thermal processes.. Varying degrees of reconstitution occur.. Reconstitution is not complete in all cases, and thus varying final diameters will occur. 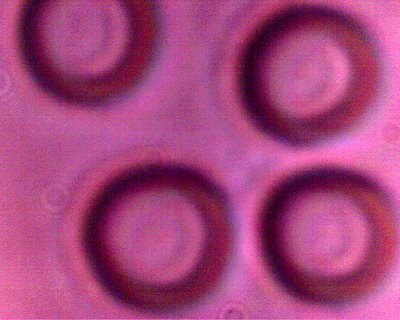 The source form appears to be on the order of four microns in diameter; the average of a final reconstituted erythrocytic form is on the order of 6-8 microns. This is also the diameter of a human erythrocyte. Biconcavity is a distinguishing visible characteristic. The fact that reconstitution of biological structures occurs within a hostile chemical and thermal environment is a primary topic of interest in the research. 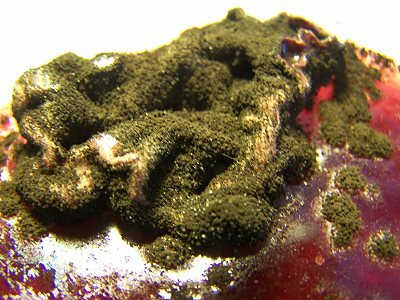 Direct evidence of decomposition of a cultured filament when subjected to alkali and heat. On numerous occasions, a breakdown in the bounding structure of the filament has been observed. The black arrow points to the boundary of the filament, which measures on the order of 15 microns in width. The blue circle encloses an erythroytic form in an early stage of reconstitution. Magnification approx. 8000x. Additional direct evidence that the erythrocytic form are contained within the filament forms. Another example of the breakdown of the filament boundary when subject to an alkali and heated solution. 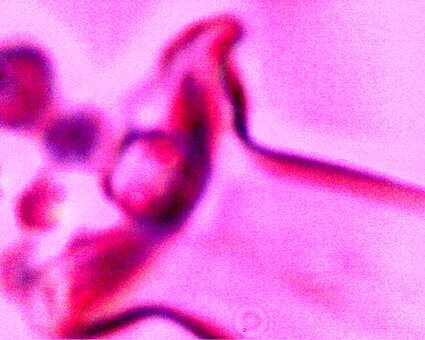 A series of erythroytic forms, prior to reconstitution, are visible emanating from the filament. Magnification approx. 8000x. An internal component of a decomposed (alkali and heat) cultured filament. 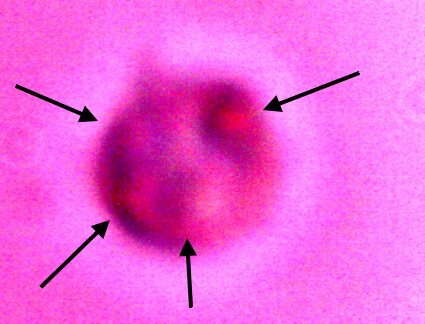 A reconstituted erythrocytic form with the intracellular sub-micron spherical structure visible (black arrow). Chlamydia-like, especially Chlamydia Pneumonia, organisms are primary candidates of consideration in the future identification of this structure. Specialized modifications to any original biological form, should it be identified, are anticipated. Magnification approx. 8000x. An internal component of a decomposed (alkali and heat) cultured filament. Another example of the intracellular sub-micron structure within an reconstituted erythrocytic form (blue circle). This phenomenon occurs frequently in observation, and is identical to that observed in the anomalous human blood observations reported on this site. The structure on the right edge appears to be an erythrocytic source form prior to reconstitution. Internal component of a decomposed (alkali and heat) cultured filament. Several examples of the sub-micron structure (black arrows) occurring within a partially reconstituted erythrocytic form. In human examples studied thus far, the damage to the integrity of erythrocytes appears to occur in direct proportion to the prevalence of the Chlamydia-like structure shown above. Magnification approx. 8000x. The Chlamydia-like structure isolated and in detail. 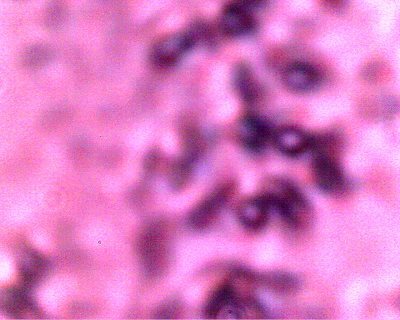 Numerous criteria (e.g, intracellular, size, Gram-Stain, symptomology, etc) suggest the Chlamydia-like organisms as a primary candidate for identification. Positive tests and additional resources will be required for completion of this stage of the research. 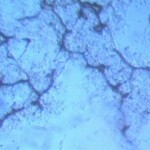 In addition, this photograph shows the structures subjected to a Giemsa staining process (methylene blue and eosin). 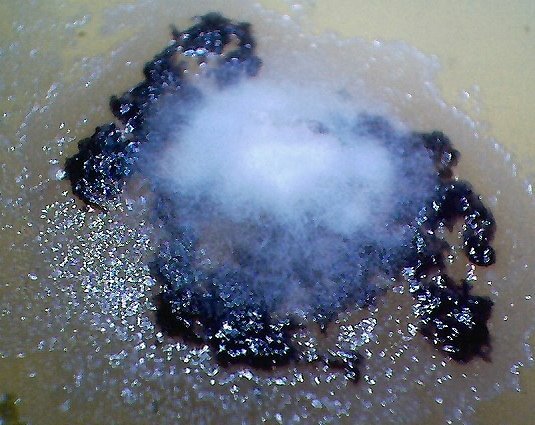 Chlamydia structures are expected to accept the blue stain under this test. This additional test is positive in this case, and further solidifies Chlamydia-like organisms as candidates for positive identification. The best size assessment thus far for this structure is on the order of 0.7-0.8 microns; also within the primary range of consideration for Chlamydia-like(esp.Chlamyida Pneumonia) organisms. A CONTROL photograph of human erythrocytes for comparison of size, geometry and biconcavity. A modified conventional analog microscope is used in this research; these modifications include the substitution of a digital camera chip for the eyepiece (CCD) and a barlow lens to increase the magnification levels. Magnification approx. 8000x. Additional examples of clusters of the Chlamydia-like structures that have been subjected to a Giemsa stain process. This stain process is damaging to the reconstituted erythrocytic forms, but it is helpful to accentuate the observation of the sub-microns structures as shown in this photograph. 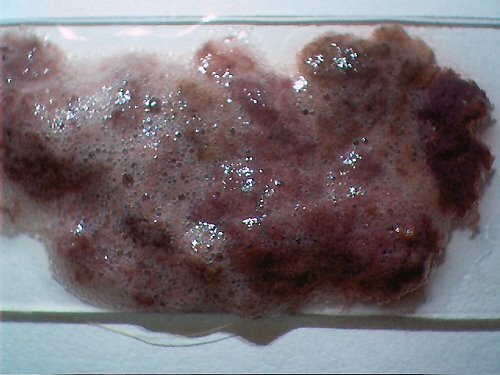 Human blood observations have shown identical forms under numerous occasions, and the severity of the so-called Morgellons condition appears to occur in proportion to the presence of this organism..
An additional example of the Chlamydia-like structures that have been subjected to a Giemsa stain process. This photograph is unique and important in the fact that it represents the first successful complete cycle of the filament culture process. 1. Biological dental filament sample is extracted. 2. The biological filament sample is subjected to the alkali and heat process. 3. 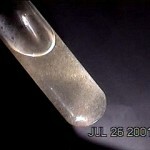 A single drop of the resulting decomposed filament in solution is placed into a wine medium culture. a) Chlamydia-like organism develops first at the bottom of the solution over a period of a a few days.. This appears as the darkened, more diffuse form shown in this petri dish. b) The pleomorphic, or tertiary form (ribbon-like) appears gradually over the next few days as well, also at the bottom of the wine medium. 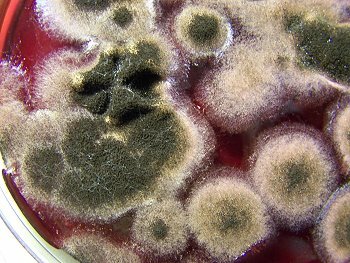 One candidate for identification of this form is mycoplasma. c) The final stage is the development of the filament form on the top of the wine medium as is visible on this photograph. The initial development of the filament will be pure white; it will eventually transform through green and black stages at maturity. 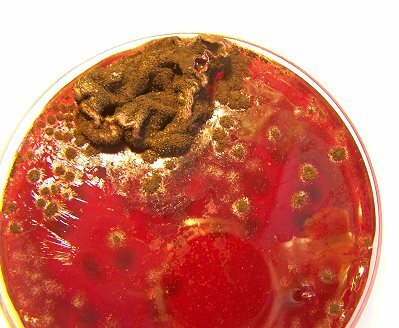 It can be concluded that a single drop of the cultured solution (decomposed filament) is sufficient to reproduce the entire growth cycle of this pathogenic form. 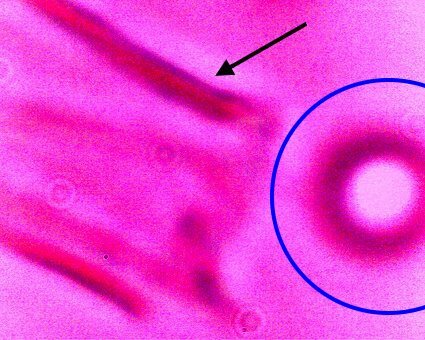 The ring like disturbance in the central fluid portion of the petri dish is due to a copper sulphate inhibition study that is in progress. .
A filament culture in a wine medium, well developed, in the mid-level stages of development. The filaments will progress though a stage of pure white, green and subsequent black color, usually over a period of a couple of weeks. An example of the pleomorphic, or tertiary form (ribbon-like) accompanied with a Chlamydia-like structure in the right central portion of the photograph. These forms develop in the culture sequence as described previously. These are the two most common forms also identified in the numerous anomalous blood observations that have been reported on extensively within this site. Magnification approx. 10,000x. An example of what appears to be a developing filament form within the latter stage of the culture sequence described immediately above. Examples of the Chlamydia-like structures are visible to the left (black arrows) and the pleomorphic, tertiary (ribbon-like) form (black arrow) is visible on the right. In addition, a coalescing and enveloping structure is visible that contains the identified components ; it possesses full similarity to the filament forms studied extensively.